ISO stands for International Organization for Standardization, which is called the International Organization for Standardization and is a non-governmental organization for developing international standards. 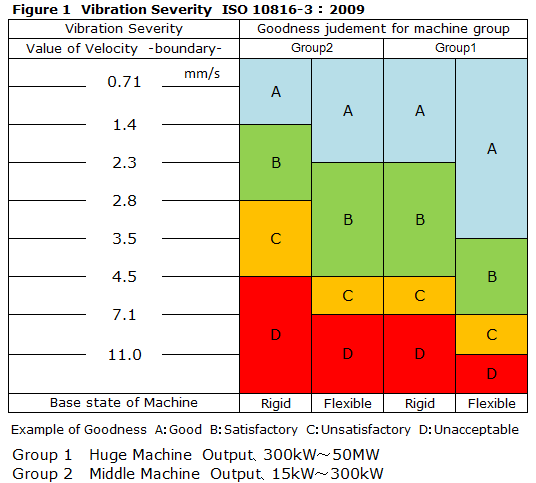 There is a description of the absolute judgment value used for comprehensive judgment of the condition in the rotary machine in the ISO standard, ISO 10816-3: 2009, and it is stated that the rms (root-mean-square) value of the velocity is used for comprehensive judgment. The overview is shown in Figure 1. A "Rigid" and "Flexible" of "Base state of machine" means that the natural frequency including the rotating machine and its attached foundation is the primary critical speed of the rotating machine (eg primary critical speed of rotating machine with 3000 rpm of revolution is judged whether it is 25% or more of 50 Hz) or not. For example, when a rotating machine with a rotation speed of 3000 rpm is fixed on the foundation, if the natural frequency including the foundation is 62.5 Hz (= 50 Hz × 1.25) or more, it is classified as "Rigid" and less than 62.5 Hz is classified as "Flexible"
Copyright © 2019 Fine Techno Coporation All Rights Reserved.